Credible Drug-Free Powerlifting Without the Politics. 72.1 kilo (159 pounds) Master 9 (82 years old) bench pressed 102.5 kilos (225.9 pounds). 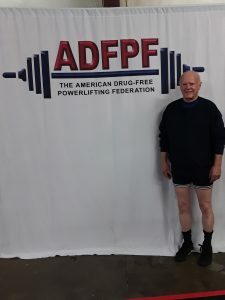 The ADFPF is a non-profit organization formed to provide all amateur athletes with legitimate drug-tested powerlifting, Strongman/women and Highland Games competitions through local, state, regional and national championships while encouraging the growth of international amateur drug-free competition. To ensure that the ADFPF, as well as all ADFPF competitions, are governed with integrity and by the highest standards of meet structure, officiating and organizational administration.